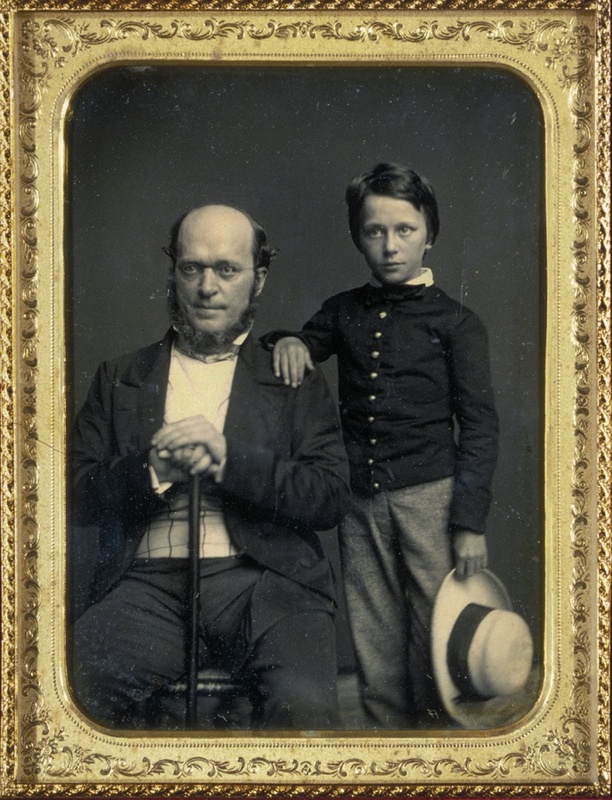 Henry James Sr. poses with his son Henry Jr. at Mathew Brady’s studio in New York City, 1854. 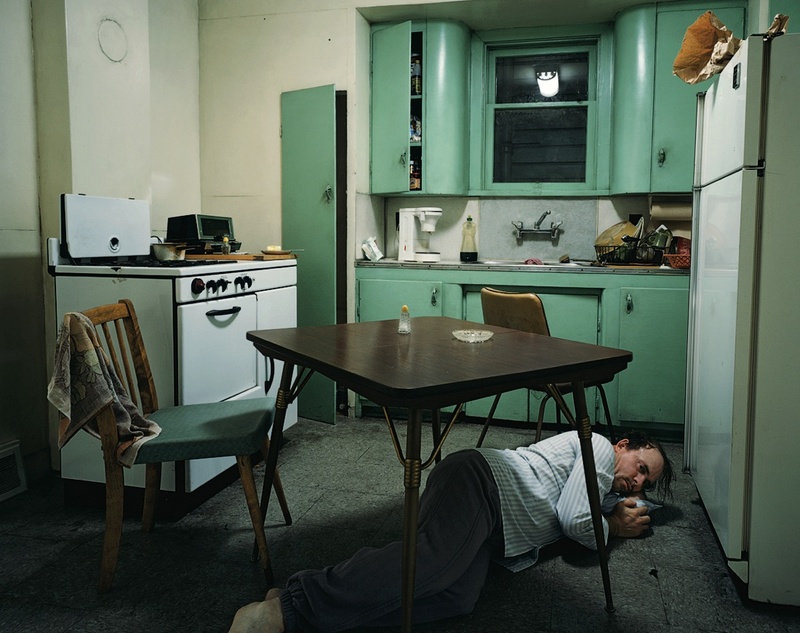 Insomnia (1994), by Canadian photographer Jeff Wall, is a completely staged cinematic photograph, set in an exact replica of the kitchen in Wall’s studio. An actor portrays the victim of a nightmarish bout of insomnia. In the photograph, Henry James Jr., the future eminent novelist, is only 11 years old. He stands beside his seated father, Henry Sr., a somewhat portly, bearded man resting his hands atop a cane, an appurtenance necessitated by the wooden leg that replaced the one he lost in a fire as a boy. 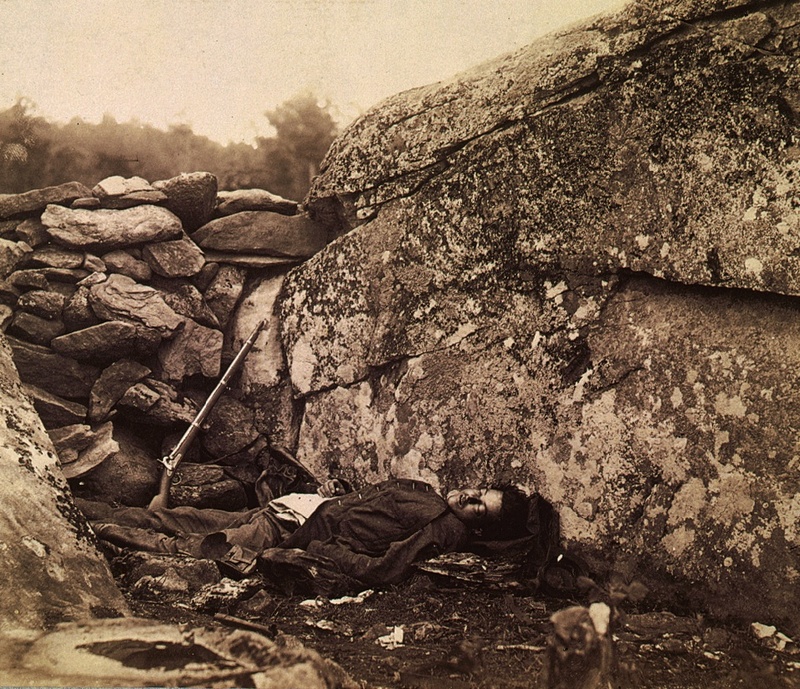 It is 1854, and the two Jameses are posed for a daguerreotype in the New York City studio of Mathew Brady, who several years later would make his place in history with powerful photographs of the Civil War. With few exceptions, scholars of art history were slow to investigate photography; instead, those in disciplines like American studies and English did the pioneering research. Recently, trained art historians like Kelsey have become deeply engaged, but it remains a small field: “We all know one another and each other’s work,” he says. (He and Blake Stimson, professor of art history at the University of California, Davis, edited The Meaning of Photography , which appeared this past year.) The study of photography is growing—part of a larger trend toward the study of visual material in general—though it must compete for resources at a time when many art-history departments are working to become less Eurocentric and to strengthen their African, Asian, and Latin American sub-fields, for example. For example, Henri Cartier-Bresson, whose astonishing street photography revolutionized the art, argued that he could compose a picture in a fraction of a second. His 1952 book, Images à la Sauvette (“images on the run,” or “stolen images”), whose English title is The Decisive Moment, epitomized this style and coined an entry for the photographic lexicon. At the other extreme, contemporary photographers like Gregory Crewdson and Jeff Wall create elaborately staged and painstakingly produced photographs that have been called “one-frame cinematic productions”—ratcheting up the authorial element by controlling every facet of the composition. Idealized self-images are buried deep in the psyche. Kelsey points to a recent study showing that when a digitally idealized image of ourselves appears in an array of images, we pick ourselves out faster than we do with an unimproved image—yet we locate friends and acquaintances more quickly from unimproved images. The practice of improving, enhancing, distorting, and otherwise manipulating photographic images with computer software—as with previous techniques to doctor photographs—has led some to predict that viewers will no longer take photographs seriously as evidence. So far, that has not happened. The torture pictures from the Abu Ghraib prison in Iraq, for example, were widely credited as evidence of wrongdoing. “The Abu Ghraib pictures were not produced by photojournalists,” Kelsey explains. “Their credibility had to do with the fact that they are self-incriminating. It’s hard to believe that someone on the inside of the prison would have doctored those photographs. The whistle-blower story was very compelling.